When using high frequency technology to produce ERW steel pipe, controlling the input power of High-frequency welding is very important. So what effect does it have on ERW steel pipe production? And what should steel pipe factory do for that? 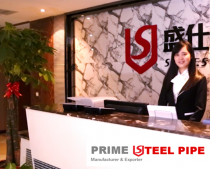 Next, ERW steel pipe manufacturer Prime Steel Pipe who has years of experience on manufacturing carbon steel pipe will give your answer. If the input power is too small, the pipe groove is not heated enough to reach the welding temperature, which can cause the welding failure such as pseudo soldering, unsoldering and slag welding. If the power is too large, it will affect the welding stability. When the heating temperature of the pipe groove surface is much higher than the temperature required for welding, which will result in severe splashing, pinholes, slag and other defects, those defect are known as over burning defects. When manufacturing ERW steel pipe, the input power of high-frequency welding need to adjust and determine according to the thickness of the wall and the molding speed. Different molding methods, different unit equipment, and different material grade of steel all need us to sum up from the production line, and work out high-frequency process that suitable for their own equipment.